Anyone wishing to see Henry Tonks’s death mask on display now has a rare opportunity to do so. With the help of the conservation team from UCL Museums & Collections the delicate mask has been cleaned and prepared for exhibit and it is currently on display as part of a thought-provoking exhibition, Voices of War: UCL in World War I. The exhibition is the result of a collaboration between students of the UCL Institute of Archaeology and the MA in Museum Studies programmes and runs to 5 April 2015 at the A.G. Leventis Gallery, UCL Institute of Archaeology. 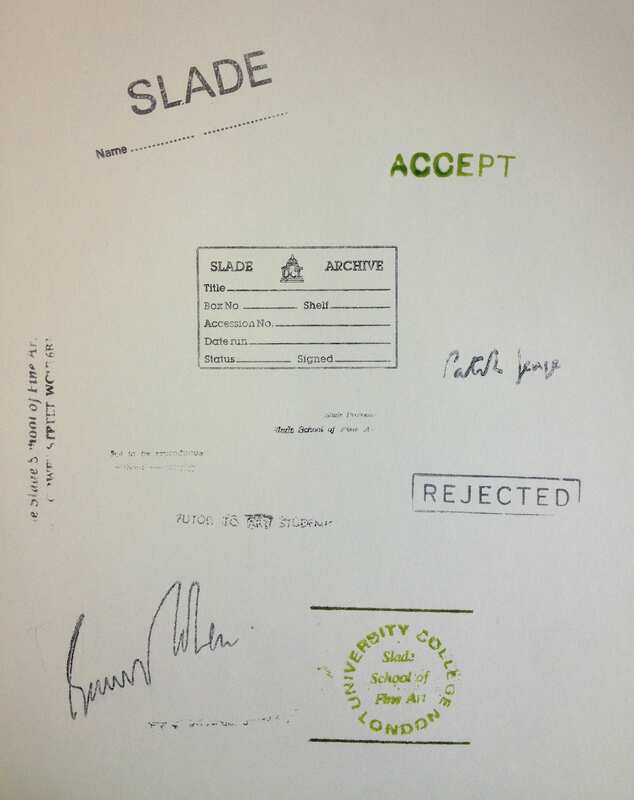 Next week the Slade will host the inaugural Slade Print Fair. 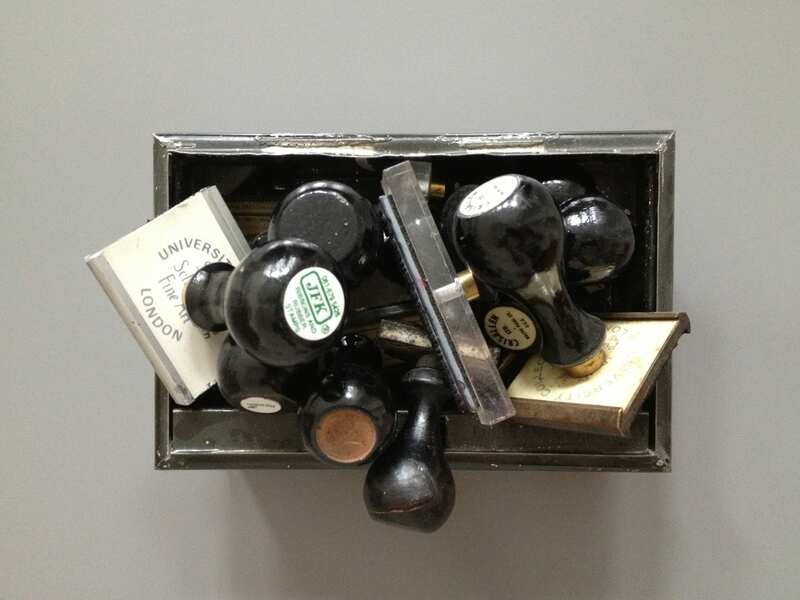 The event will not only celebrate the Slade’s rich & varied printmaking culture, it will also raise much needed scholarship funds through the sale of prints and multiples by Slade alumni, staff and current students – the list of names is impressive indeed! To mark the occasion, we’ve added some excerpts from an interview with Bartolomeu dos Santos to our growing list of highlights from the Slade oral history collection. Dos Santos (1931-2008) was a student at the Slade from 1956-1958 where he became enthralled by the possibilities of printmaking. He joined the staff in 1961, becoming Head of Printmaking and eventually, in 1994, Professor of Fine Art. In these excerpts he talks candidly (and complete with Portuguese accent) about his early days as a student at the Slade in the mid-1950s. There will also be a Slade Archive Project display on site for the run of the print fair so if you’re in London do come by. It’s a great opportunity to see some of the intriguing items from the archive and to contribute to the new class photos crowdsourcing project. 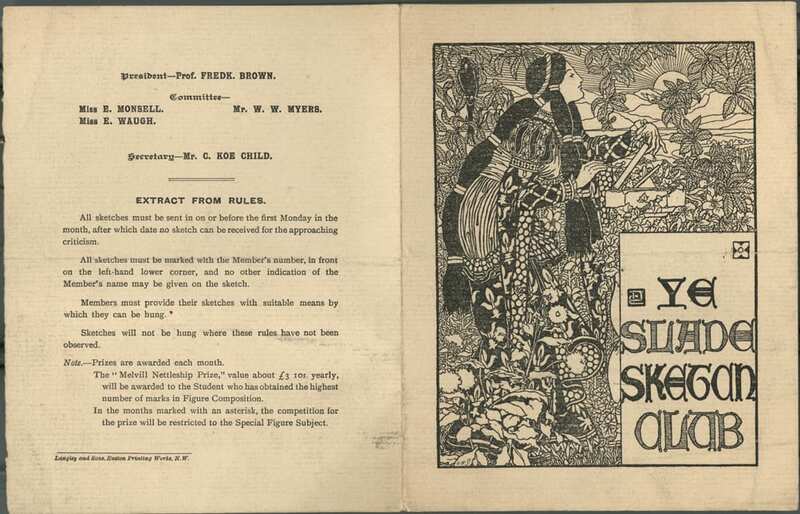 Another remnant of ‘Ye’ Slade Sketch Club, a beautiful little leaflet dating from 1899. 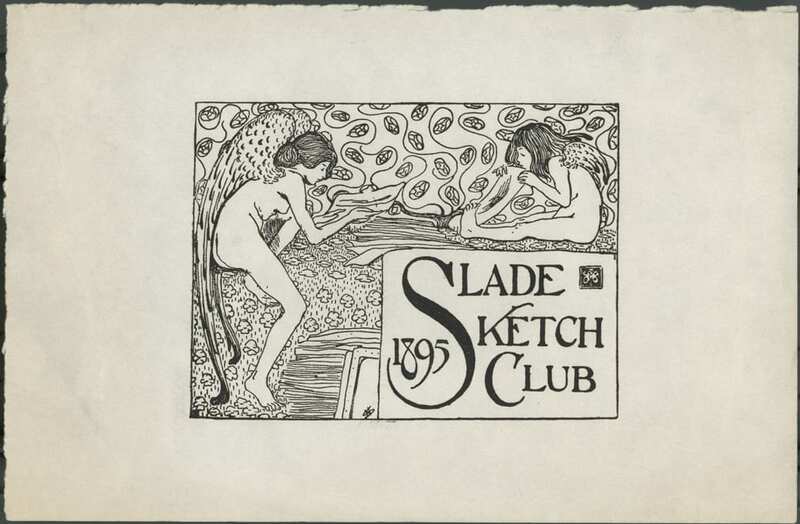 Slade students were encouraged to join the Sketch Club, which was structured around a series of set composition subjects and monthly prizes. 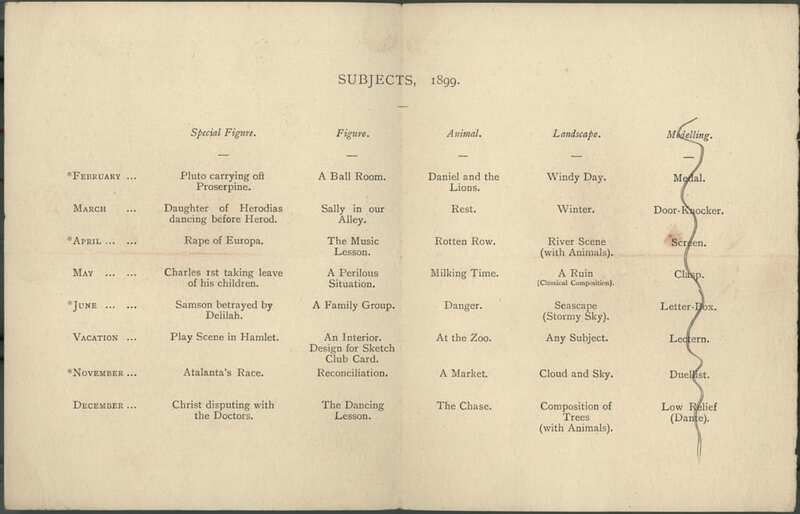 The 18th-century traditional song and poem ‘Sally in our Alley’ included in the list of composition subjects shows how the club encouraged the exploration of themes beyond traditional biblical and classical subjects. 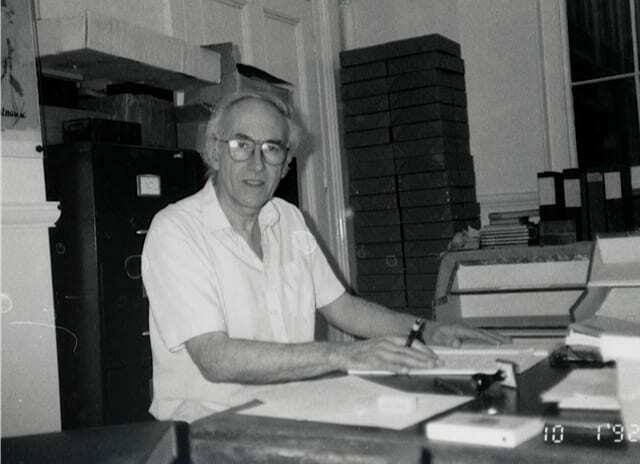 The inclusion of poetry, drama and literature as optional subjects continued under William Coldstream’s professorship. 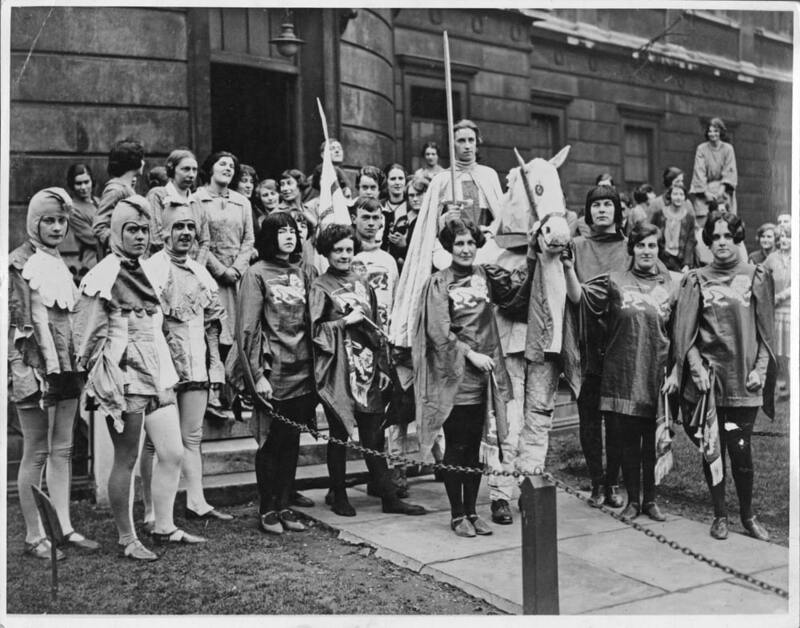 Slade alumni of the 1950s, for instance, have described how T.S. Eliot’s classic poem ‘The Waste Land’ and Dylan Thomas’s 1954 radio drama ‘Under Milk Wood’ were two of the themes set for the summer composition competition. It’s not clear when (or why) the club disbanded; any leads from Slade alumni on this subject would be most welcome. Evidence of the Slade Sketch Club found carefully tucked away in an archive box. Remember these? 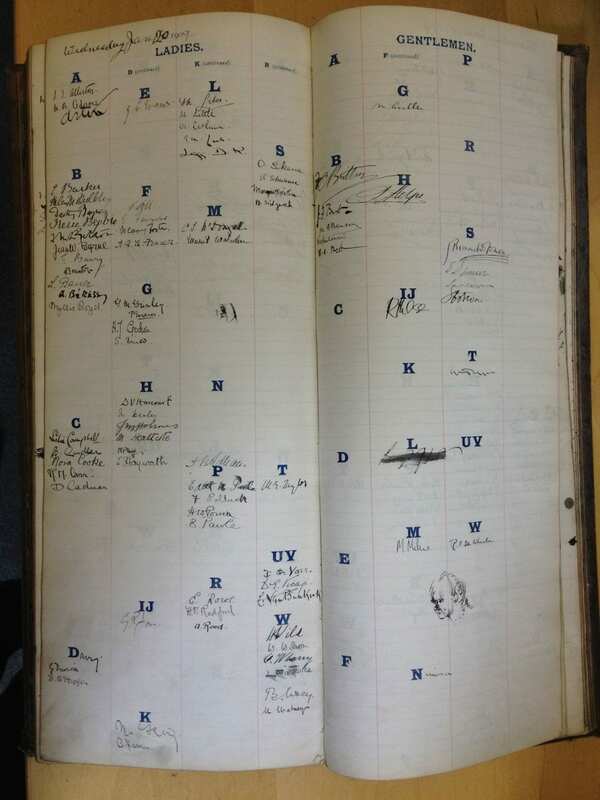 I spent a few minutes trying out these remnants of a bygone era of administration … and found signatures of former Slade Professors Bernard Cohen and Patrick George in the mix.